Now that I'm done with my Master's, I've been finding myself with lots of free time. Fortunately, I've amassed a small pile (okay, quite large) of books that I'm starting to tackle. Right close to the top was Old Man's War, by John Scalzi, which was recommended to me by a number of io9 readers after releasing a list of top military SF books and films. I hadn't included this book because I was unfamiliar with it, but after reading it, it certainly deserves a place on the list. 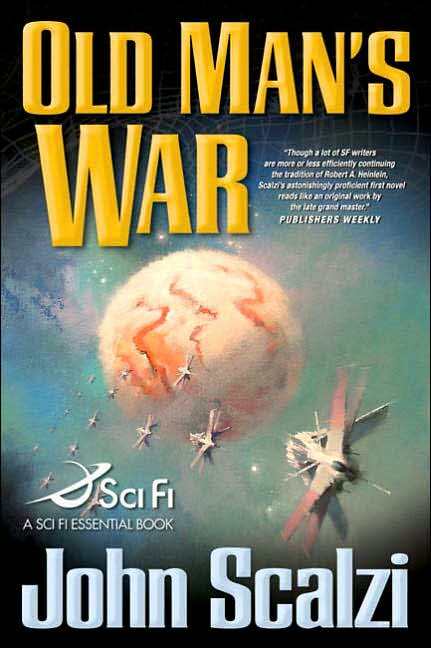 Old Man's War was Scalzi's first science fiction novel, and for it, he won the John Campbell Award for best new writer. The story follows John Perry, a seventy-five year old man on Earth who has joined the Colonial Defense Force (CDF). People of his advanced age are specifically recruited because of their lifetime of experiences. He receives a new body, bonds with new fellow recruits and goes into training to become an advanced soldier. Humanity has spread to the stars, and its numerous colonies are largely under constant threat from other alien races throughout the galaxy. Perry goes into action with his unit against numerous races in a number of various battles, before a fateful final battle that leaves him the only survivor. This is a fun read. Scalzi does a good job conceptualizing a futuristic warrior, the training and captures the battlefield and training bond between soldiers. A constant theme that is explored throughout the book is the idea of fighting for humanity, as a race, despite being a radical variation of said race, while not fighting specifically for a unified government or planet. The soldiers go from fighting for a grand concept such as the survival and foothold of the human race to something much smaller and more concrete, fighting for the survival of their unit. Fans of military science fiction will really enjoy this book for the tech and action. Scalzi sets some fantastic battles throughout the story, and does a good job linking some of them together along with John Perry's reaction to warfare and his role that he's playing. A particular draw of military science fiction is the advanced super soldier, and Scalzi's green, cat-eyed, rapidly healing and computer interfaced soldiers are nothing new to the genre, but they are fun to read about, and provides just enough new twists to the concept to make it modern and interesting. On the whole of it, the book is a very standard military science fiction novel. It is a fun read, but it has a number of flaws throughout that substantially weakened the novel. The first of these is the title of the novel, and the gimmick that is relied on - the use of old men and women as soldiers, because supposedly their lifetime of experiences will help with their combat experience. This is only touched upon in the book - it's noted that soldiers have a lifetime of experiences to undo, and throughout the novel, Perry only references his old life back on Earth a handful of times. There's very little practical help that a long life really provides for a soldier, save for one, and that's the link to humanity and earth, but even then, that is not utilized in a way that it really could have been, and all in all, older soldiers are really no different than younger ones, given the tech and upgrades that they receive. Furthermore, the end of the book sees the introduction of the Ghost Brigades, experimental soldiers who have grown up fighting, who seem to be generally more effective than the regular soldiers. This entire aspect of the book left me wanting for more. The last quarter of the book felt incredibly rushed to me. An alien race has utilized a new technology that proves to be devastating to the human ships during one of the final conflicts in the novel, and Perry is assigned to help the Ghost Brigades capture the devices on the planet. This to me seemed to have very little relation to the experiences that Perry had accumulated throughout the book, breaking an overall good story and character arc, and it misses the vital arguments above that would have helped link Perry's motives in the military with the rest of the human race. Instead, it was a final bang and exposition to which the book ends and it left me both disappointed that there wasn't some revelations to be found from the characters, and that it seemed to just exist for the sole purpose of the next book, titled The Ghost Brigades. Scalzi falls into a trap that a lot of military science fiction writers seem to fall into: take soldiers, enhance them, and then turn them loose against alien foes. Essentially, most military science fiction novels utilize military doctrine and tactics that seem to be right out of the Second World War 2 or Vietnam, with little exploration to how the military actually works, and how military tactics change to reflect new technology. Infantry warfare is one of the earliest types of warfare, and I honestly find it difficult to believe that it will exist in the future as it is portrayed. There is no mention of other styles of fighting, such as maneuver warfare that pairs up infantry with armored forces, or the capabilities of air power against infantry forces. A quick survey of warfare in the past couple of decades will show that both are as equally important as infantry forces. Indeed, this is the future, with far advanced technology - what advances might there be in the next hundred years, and how will that inevitably impact warfare as we know it? People with guns in hand fighting as they do in this book is a fairly unrealistic method that places characters in an extreme situation to extract some sort of revelation - that never really comes - from the protagonist. Furthermore, while Scalzi has put forth a fairly well worn and conceptualized universe, the entire system of the CDF and colonies isn't fully explained or realized in the book. There doesn't seem to be any unified system of government between the colonies, and the CDF is deployed at a moment's notice to wherever there are problems with one of the colonies. For a massive government waging constant war against aggressors, it seems illogical that there doesn't appear to be any sort of overall plan or guiding strategy that both utilizes diplomacy to secure its borders and military force as a way of enforcing those borders, if you're a student of Clausewitz. Military forces are not deployed willy-nilly in the real world, without extensive benefits to that government. Here, the colonies seem to be fighting holding actions, with some allies, to hold onto their planets. The absence and outright rejection of diplomacy in this world seems even more illogical. That all being said, this is an interesting, fun and light read for anybody who is inclined to read military science fiction. While the book doesn't really add anything significant to the subgenre, that's not necessarily the requirement for a good read in the genre. I am interested to see where Scalzi will take this world and characters, and as such, I've already picked up The Ghost Brigades. Hopefully some of the issues will be corrected at some point in the upcoming novels in his series, and if not, it's not detrimental to the world that has been set up.